A stable structure for dynamic spaces. Horsepower by Antenna Design is a visually light technology channel, spirited in form and steady on its feet. The independent, cord-set module serves as an on-demand, mobile power source suited to a range of Activity Spaces. Video display, whiteboard and open storage options equip flexible, shared work areas. Linked Horsepower modules can also furnish dynamic open plan environments with hardwired multi-circuit power, cable management, suspended storage, desk supports, modesty panels and privacy screens. Optional seat cushions create an impromptu power bench in community spaces to sit and recharge. COMPACT TECHNOLOGY CHANNEL. Horsepower features an elevated, freestanding beam structure with integrated power and data distribution for open-plan workspaces. FLEXIBLE TOOL FOR DYNAMIC SPACES. Horsepower brings power on demand to any space –scaling to provide portable technology solutions for a range of Activity Spaces and primary spaces. PLANNING FLEXIBILITY. Horsepower reflects the performance standard and straightforward design of Antenna Workspaces, providing an intelligent structure that allows for endless planning flexibility. Mobile Horsepower enables users to connect, access and display technology to support the task at hand. 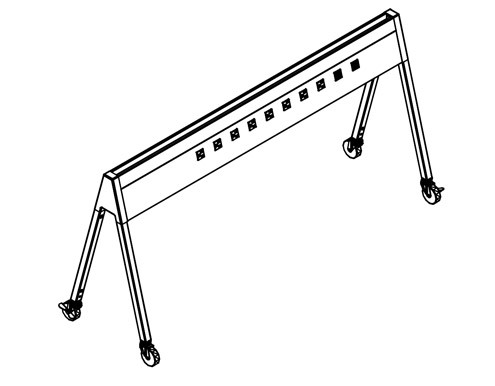 Horsepower mobile carts can be specified with integrated power strips, monitor support, storage and worksurfaces. Horsepower perch invites people to connect — to each other and their devices, offering a comfortable seat for casual exchanges and convenient access to power and USB outlets. Compact Mobile Horsepower units can be fitted to support the Antenna Workspaces rail system, creating flexible desks and tables with discreet power access. Horsepower features a light, open service beam for primary workspaces, distributes power and data, and supports desks, suspended storage, glass laminate or fabric screens. 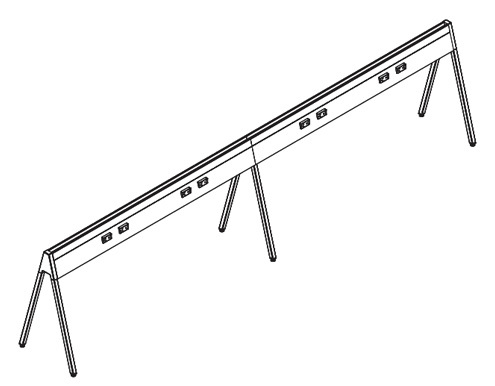 The Beam is an ideal technology channel to pair with height-adjustable surfaces for ultimate planning flexibility. Antenna desks can attach along the length of the beam at any point, while integrated storage, screens, shelves and lighting shape an individual or group space. The lightweight structure of Horsepower allows for quick and easy reconfiguration without disassembling the spine or adjacent freestanding workstations.